For those of you who don't follow my Facebook page and have been missing this year's Redtailed Hawk babies in my neighborhood, here are some fun photos to get you up to speed!! 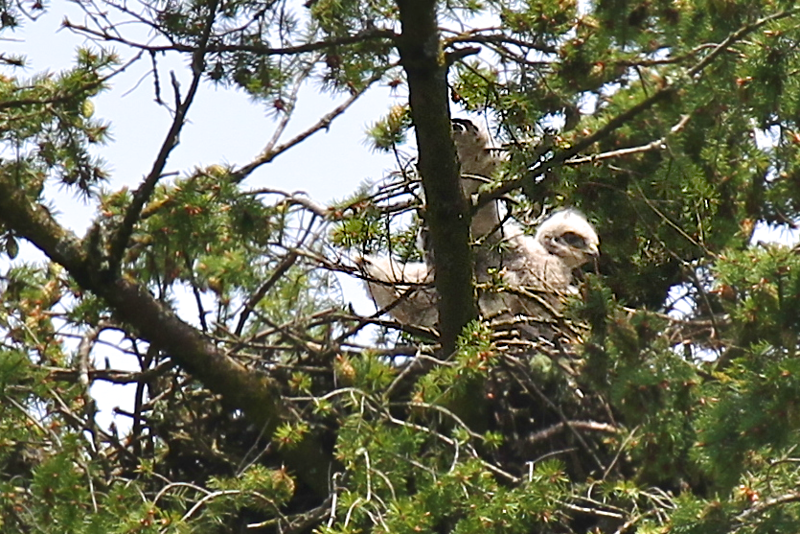 Above is a shot of one of the chicks hanging onto the nest as he exercises his wings. We had 3 chicks but I haven't seen the 3rd for about a week now. The crows have been relentlessly bullying the hawk nest so I am hoping the chick wasn't killed. I saw 2 chicks for certain yesterday so that's a releif at least. To give you an idea how hard it is to get photos of these birds, the nest is WAY up in the top of the Douglas Fir at the back of our property in the neighbors yard. I am using a 100-400 zoom lens maxed out at 400mm. Because the distance is far and the target very small for that long of a reach, the photos are virtually impossible to make super clear and crisp, but still….. I'm pretty happy with some of these shots I've gotten over the past month of nest watching. It's more about the memories than great photos anyway. I took this with my iphone to show you my setup. Lil was helping…shes an accomplished bird watcher! We had to quit feeding the local song birds because our feeders ended up becoming a handy feeding station for the hungry hawks too!!. I have a couple of photos in the slideshow showing the parents coming back to the nest with birds they caught. Click on the slide show below to see all the photos of the nest I have taken so far. The first photos are the most recent, going back to when the eggs were unhatched. I will be adding to this album as I take more photos so you can keep up on the nest that way! HAVE A FUN AND SAFE MEMORIAL DAY WEEKEND !! !